Periodontal disease, commonly known as gum disease, can have a devastating and far- reaching impact to your overall health, appearance and confidence. An experienced, proven team is essential for mitigating the negative consequences, offering personalized treatment plans and aiding in long-term prevention. Responsible for 75% of adult tooth loss, periodontal disease is caused by a bacterial infection that attacks the gums, tissues and bones surrounding your teeth. As the bacteria grows and your gums become weaker, they will begin to bleed. The blood feeds the bacteria, which in turn strengthens the attack on your gums. 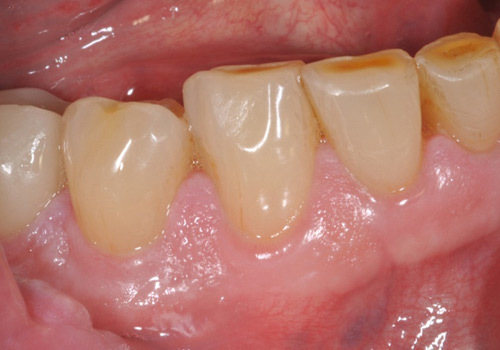 When periodontal infection takes over, your gums and bone become too damaged to support your teeth. They become loose and — in most cases — are lost. In addition to damaging teeth and gums, periodontal disease can contribute to a compromised immune system, heart disease, respiratory conditions, osteoporosis, diabetes and even premature births. Gum weakening is gradual, and people who have periodontal disease are often unaware the bacterial infection has set in. Initial symptoms may include a change in gum color or light bleeding when brushing teeth. As the condition develops, the plaque layer that builds up around your gums becomes a harder layer called tartar. Tartar begins to push the space open between your teeth and gums. Initially these pockets may not be very noticeable. They will become larger if the tartar is removed, making your gums more sensitive and swollen. Accompanying symptoms include bad breath, receding gums, mouth sores, loose teeth and increased bleeding at the gum line. Once periodontal disease has developed, it’s important to assess how much damage has already occurred, and whether routine cleaning can curb the problem or if more aggressive treatments are needed. The American Academy of Periodontology stresses that periodontal health should be achieved in the least invasive and most cost-effective manner possible – a guideline we adamantly and willingly abide by. Whenever possible, we employ non-surgical, minimally invasive treatment options. All of AZPerio's board-certified periodontists are skilled at using advanced laser and surgical techniques to combat the disease. The key to controlling gum disease is early diagnosis and treatment, followed by regular preventive treatment such as consistent periodontal cleanings. Periodontal maintenance procedures help control the progression of the disease and increase the chances of keeping your teeth. We recommend such therapy every three to four months, depending on individual circumstances. In more advanced stages, surgery may be needed to remove bacterial infections and restore the damage that has occurred. During a pocket depth reduction procedure, also known as “flap surgery,” we can fold back the gum tissue and remove bacteria collecting underneath the gums, as well as the hardened plaque and tartar. If necessary, we can remove any irreparably damaged tissue and then suture the healthy tissue into place. With the tooth and root free of bacteria, plaque and tartar, and the open spaces between teeth reduced (pockets), the patient’s gums can begin the process of reattaching to the teeth. In some cases, we can utilize a dental laser to manage gum disease. Specifically, the PerioLase MVP-7 Digital TruePulse™ Nd:YAG laser – the first digital laser in dentistry to incorporate digital technology – generates a wavelength that attacks bacteria and tartar, and decontaminates the periodontal pocket. It’s used to perform the LANAP® Protocol for treating gum disease, as well as all other soft tissue procedures. This procedure doesn’t require a scalpel and stitches, and healing is relatively quick with very little discomfort. Please take a few minutes to answer the questions on this assessment so that we can gauge your individual risk for gum disease and tailor our treatment recommendations to your specific needs.